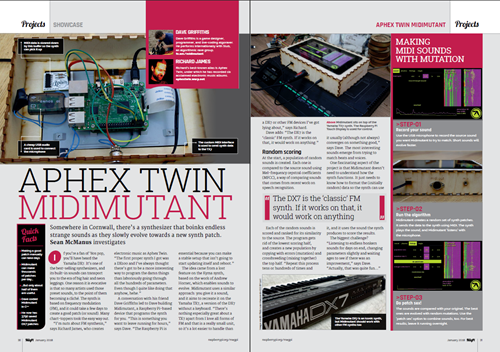 The current issue of The MagPi includes a feature I wrote about Midimutant, a Raspberry Pi project for programming the Yamaha DX7 synthesizer. The DX7 was popular in the 80s, but was hard to create new sounds (or patches) for. Richard James, who records as Aphex Twin among other aliases, suggested that there must be a more interesting way to program an FM synthesizer and his friend Dave Griffiths took up the challenge. Using a Yamaha TX7 (which is like the DX7 but without a keyboard), he made a Raspberry Pi project that randomly generates sounds and then mutates them until they come close to a particular target sound. The project is broadly applicable, because it doesn't need to understand how the synth works: it just needs to be able to create random data for it to play back, and then listens to the result. "It's actually most interesting when it doesn't quite work," says Dave. "Discovering that some cymbals were all evolving to silence as the background hiss from the TX7's 12 bit processor was considered a close enough match, was an 'aha' moment - these types of evolutionary algorithm have a tendency to surprise you like that." Richard says he will be using the results on his tracks whenever possible, so you might well hear Midimutant's results before too long. To find out more, check out issue 65 of The MagPi. It's in shops now, and it's available for free download too. While you're there, you can also pick up MagPi issue 64, which includes my report on Pycon. Any idea when the code will be available?